We were asked to superimpose a grid on the video output of an IP camera for this year’s FIRST FRC competition, FIRST STRONGHOLD, a sort of medieval-themed contest with a castle and medieval-inspired obstacles. The present thinking is that a cheap D-Link DCS-931L camera will do just fine. It’s $30 on Amazon. I found this is a real research project because it is poorly documented. So in this blog I show how to do that. and that’s all i could find! I thought, OK, I can work with even that. I’ll build a web page that includes that as source image and refreshes itself as fast as possible! And despite the crudeness o that approach, it actually worked. It was a little laggy (maybe 1.2 s or so) an a little jumpy, but good enough for our purposes. Time permitting, I will share that crude code. and you treat it like an image file. So i carefully implement the Stackoverflow code. you have to understand that it’s presented so tidily that you feel there’s no way it could not work. I tried it out in Firefox. No matter how much I proof-read my code, it only drew the vertical bars of the grid, but not the horizontal lines! So Firefox’s either has a bug, or the features of CSS aren’t agreed upon by all major browser vendors. At some point I came to try my code in Chrome – worked great! That was a shock. But I wanted it to work in Firefox since that is my principal browser. I finally found that for whatever reason, in Firefox the horizontal bars have to be drawn using a different function. Instead of a more simple linear-gradient CSS function which works just fine for the vertical bars, you need to resort to a more complex repeating-linear-gradient function. so putting all this together we arrive at the html page code. It’s nice and brief. Well, mostly. This puts a horizontal bar every 80 pixels. If i change that 80px to 15% (which is the parameter in effect for the vertical bars due to the background-size statement), it will work OK in Firefox. However, it does not work in Chrome. With 80px it works in both browsers. Needless to say, dcs-931l is just the hostname of the camera, assuming that mDNS is all working which it generally does. You can replace that with the IP address. of course you have to be on the same LAN as the camera. This is not a setup for viewing the camera from the Internet which I haven’t looked into yet. mDNS is multicast DNS. I think this technology or its equivalent is pretty common in home networks these days. It’s a convenient way to assign (and later refer to by that name) a hostname to a dynamic IP address. There’s a Wikipedia article about it which gets pretty technical. It shows up a little differently, but that’s what I typed in. And here’s a screen capture of my live video with the grid superimposed, just so it’s been documented as really working! In this blog post I show an accessible technique for measuring lag that only requires two smartphones. I love to show this to students. They get all confused at first, but when you do it you see how obviously simple and accurate it is. So we measured the lag as .51 seconds. So not the best, but not terrible either. Now that we’ve set up the basic approach, changing from a whole grid to just crosshairs, with thicker lines is as simple as changing 15% to 50%, plus changing 1px to 2px. That is the Firefox version, of course. Replace your_camera_password with your camera’s password. Don’t use a password which contains the “@” character or things will get really complicated! Link to competition information, including brief videos. Cheap but functional D-Link video camera. Stackoverflow description of superimposing a grid on an image using CSS. Multicast DNS is described in excruciating detail here. 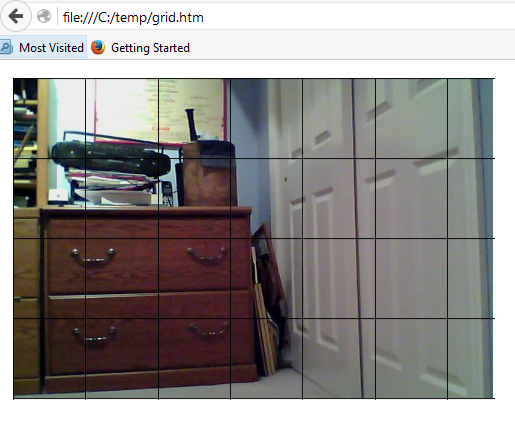 Blog post on measuring lag and getting streaming to work on the Raspberry Pi camera. This entry was posted in Network Technologies, Web Site Technologies and tagged css, Firefox. Bookmark the permalink. I need grid lines on video out put, I have a video I want to share.